Update: BoingBoing has a lovely interview with one of the students who was sprayed by the police. Alexis Madrigal writes a sharp historical review of how policing has changed since the 60’s, and the dramatic rise in paramilitary training and expectations among police forces across the country since the Seattle WTO protest. We need to recognize the systemic problems everywhere in the US, now filtering onto university campuses, and address them at their heart. That said, we still have clear legal standards for when it is and is not appropriate to pepper spray civilians in the course of policing. In prisons, riots, or public squares, precedent suggests it can not reasonably be used on seated or immobile protesters. Pike violated federal law in his use of excessive force, and is unlikely to be protected by the qualified immunity sometimes granted to officers. 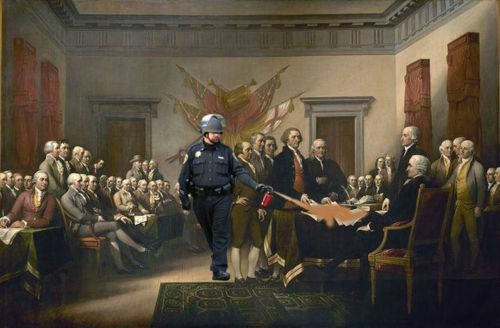 Since a number of the students sprayed were injured, some still hospitalized the next day, and this use of pepper spray is usually considered to ‘exceed reasonable bounds’, Pike and his department face significant legal challenges. They will almost certainly try to settle any claims out of court. Hacking the dollar bill to visualize gobal finance. Together we will move in ways that none could move alone. From the WSJ : daily roundups and live stats. MoJo maintains its own terse summary and map. And a rare taped Sachs-Ferguson spat is worth watching for the last :30.